Dragonfly students recently returned from spring break trips where they adventured around Southern Oregon and Northern California. These trips provide a great opportunity for exploring nature, connecting with peers and feeling refreshed before returning to continue their school year. Here are some photos and highlights from the adventures shared by Dragonfly students and trip leaders. As a large majority of Dragonfly students come from wilderness therapy programs, our trip into Northern California’s Redwoods offered us opportunities to reconnect with nature, reopen the senses again to the fresh forest air, feel the coastal breeze, and smell the redwoods all around. Our journey to visit some of the oldest beings on the planet took us across Southwestern Oregon into the Northwest corner of California. We set up camp under some younger redwoods outside Jedediah Smith State Park, and quickly began to feel the slow pulse of the forest while we explored the campsite. On our first day we explored the Smith River. Working with Redwood Rides, a guide company from Hiouchi, we prepped and got ready to raft and kayak down the Smith amongst the redwoods. 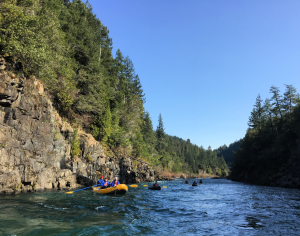 We started our 8-mile journey along the Middle Fork of the river, where students boarded their rafts, and two adventurous souls captained their own kayaks. Once past the South Fork, we stopped at a small secluded beach to enter some old growth redwoods. It was mesmerizing strolling under the canopy of these red giants soaring a couple hundred feet into the air. We had the space to ourselves as students enjoyed facts and stories shared by their Redwood guides. We eventually got back to our boats and continued downstream into one of the wildest stretches we would face, the Disneyland Rapids. The rapids provided what felt like a real-world Space Mountain, as we sped through waves and rocks, sending water into our boats, and excitement through our veins. We finished up our journey on calm waters, and even spotted a seal! After riding through the redwoods, we finished off our day by exploring the Scout Trail and some of the largest coastal redwoods. Walking under the canopy several hundred feet up, students embraced the experience, some even showing their appreciation with a big redwood hug! Over the next few days we explored the California coast, prepared delicious camp meals, played games, and shared stories around the campfire. We spent the final morning participating in a concluding group where students reflected on the trip. For most, a common theme was getting recharged with some intentional time in nature. Our group traveled from Klamath Falls, Oregon on the beautiful drive to Gold Country, California. Coloma is the small town where gold was discovered and lies seven and a half hours away from Klamath. Coloma has many quaint old buildings and we saw an authentic blacksmith shop from the 1850’s that was still in action! It was fun to explore the town and glimpse what it would have been like to live there during the famous gold rush. 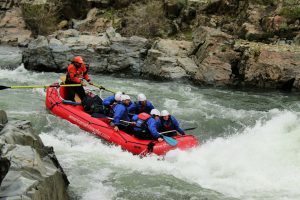 A highlight of our trip was rafting the American River! We were outfitted with wetsuits and splash jackets to protect us from the freezing river. While it was still cold, the beautiful scenery, glimpses of wildlife, and serenity of having the river to ourselves made it well worth it. Not to mention the rapids! We may have lost a student overboard a time or two, but we always managed to get them back in the boat and carry on together. Some brave souls even jumped in voluntarily. Rapids on the American River! The second rafting day was shorter but no less fun. In fact, the last rapid was quite exciting and happened to run right by our campsite! It was convenient to pop right out of the river at the end of the day and be right where we needed to be. Another delicious lunch was provided by our guides, and we were able to spend the afternoon enjoying the beautiful area around camp. That evening we adventured into the nearby town of Placerville for dinner. We reminisced and laughed about our favorite moments and shared feedback about difficult times. From the incredible nature we got to explore to the tremendous fun we had on the river and around camp, this trip was worth its weight in gold. 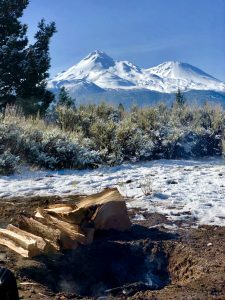 The seven students who opted for Mount Shasta were bravely inviting a wilderness experience that would be spent alone – done introspectively as a Solo. Arriving on the land, students were led several hundred feet from each other, into individual camp sites where they set up their own spaces. Two students with past wilderness experience sought shelter via tarps tethered to nearby trees, while others utilized traditional tent enclosures. Folks then rejoined the group and received a workbook which outlined the history of solo experiences, spiritual resources, and a series of questions designed to deepen reflection of one’s inner self. As snow began to billow down from the sky, all members of the group were directed to walk in silence towards a distant ceremony site to open the Solo time. Mentors spoke on the sacredness of respecting each other’s experience and of resiliency garnered through sitting in discomfort. Everyone stated their personal intention for the solo period and walked out into the haze of thick snowy fog – officially beginning their solo. Remarkably, the following day opened with clear blue skies and sun that quickly melted the snow-covered floor. On the morning of the third day, individuals were awoken by the roaring sound of wind and rattling of tent poles, as powerful gusts caused the walls of their shelters to concave. We decided it was no longer safe to persist through the storm and loaded up the trailer to set out for dry refuge at the Homestead, back in Klamath Falls. Reestablishing intentionality, mentor Elliott taught a lesson on the Native American Medicine Wheel and adapted the content to identify each student’s astrological information. In honor of the hard work students already invested in their solo, the group was taken to a local restaurant to eat together. On the final day, we prepared for the closing ceremony and mentors created new, metaphorical names, to symbolize how each individual student was recognized in their therapeutic and Solo journey. Before dusk fell upon the Homestead pond, students were called one at a time to a fire pit, where we welcomed them into ceremony. Stories were shared of insight, resilience, acceptance, and self-empowerment. To the surprise of many, the trials and tribulations endured from the treacherous Shasta weather introduced an element they did not expect; one of greater collective intimacy and interconnectedness. Our group packed up and traveled to Cape Perpetua to spend some time along the Central Oregon Coast. The first day we set up camp and explored Devil’s Churn, Thor’s Well, Cook’s Chasm and the Sprouting Horn. These sites included a lot of rock scrambling, tide pools, big waves and beautiful ocean views. On the second day, we ventured to Honeyman State Park to try sand-boarding on the dunes but unfortunately the sand was too wet for the boards to work, so we enjoyed lunch on the lake shore. One student caught three trout that we cooked for dinner that night! We explored Old Town Florence in the afternoon and went to the Dean Creek Elk Viewing Area where we saw a herd of Roosevelt Elk, the largest of the four elk species in North America. On the third day, we visited South Beach State Park, where we walked along the jetty listening to the sound of sea lions. We also braved the rough waves of the ocean on a whale watching tour in Depoe Bay. Due to most of the crew getting seasick, the tour was cut short, but we saw some spouts from grey whales among the rolling roller coaster of waves. We then headed to the Oregon Coast Aquarium to warm up and see other sea life. Our day on the coast was spent doing a trust and team building activity on Hobbit beach, where students had to lead a peer blindfolded along a pathway and across a slack line using only words to guide them. We then went on a dune buggy tour along the Oregon Sand Dunes and rode horses along the beach. It was incredible to see some of our students’ talents in riding horses and to witness those students who were unsure tackle their fear and really enjoy horseback riding. Overall the trip was a positive experience and left the students ready to begin the next school term!